Mark Ryan is an actor who has appeared in many plays, TV shows and movies. He was in the original production of Evita. He has contributed to the Arthurian legend as an assistant sword instructor and actor in First Knight. His work includes appearances on Frasier and the new Conan series. He was also the swordsmaster on the Canadian TV series "The Secret Adventures of Jules Verne", and in 2000 he toured with Eric Idle in "Eric Idle Exploits Monty Python". He also played "Mac" alongside Lewis Collins in "Who Dares Wins". 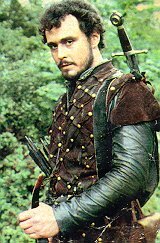 He played the role of Nasir in the popular British television series Robin of Sherwood. Nasir was the first Arab member of the Merry Men. He also co-wrote a Robin Hood comic book story in DC Comics' Green Arrow. And he has designed the Greenwood tarot which uses some Robin Hood imagery. Click here for an interview about his Robin of Sherwood work.